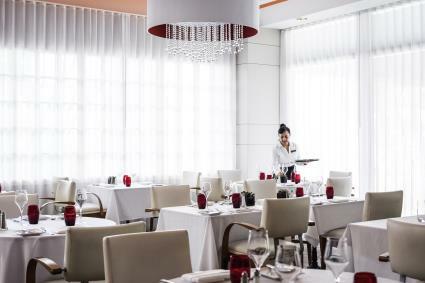 Please present your SimpleAirportParking.com parking receipt at the Front Desk to receive a 10% off coupon for La Riviera Restaurant. Starbucks coffee shop available on the property. We recommend that you arrive to park at least 30 minutes before you wish to arrive at the airport. Enter this location at 5800 Blue Lagoon Drive; this is the Pullman MIA Hotel uncovered self-park lot. It is located on the south side of Blue Lagoon Dr. between NW 57th Ave. and NW 62nd Ave. When entering the lot, make a right after entrance gate (do not park in front of the hotel) and visit the hotel front desk to present your SimpleAirportParking.com prepaid receipt either on your cellphone or hard copy. FREE shuttle service from 4:30 a.m. - 11:30 p.m. to MIA and back is available to airport parkers from this location every 30 minutes on the hour and the half-hour. Outside of these hours, transportation is not provided or arranged by the hotel. When you return to MIA, board the return shuttle on the 2nd floor of MIA near DEPARTURES. Look for a white shuttle with 'Pullman Hotel' lettering on the side. 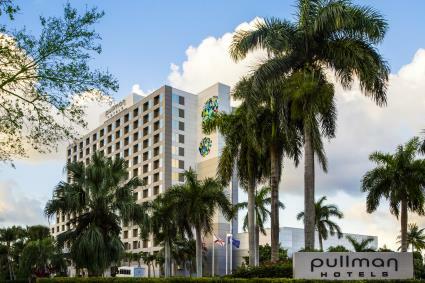 Pullman Hotel offers you an inexpensive alternative for MIA parking with a free hotel shuttle that runs to and from the airport. 24-hour security staff and exterior video surveillance make this a safe location to leave your vehicle while traveling.